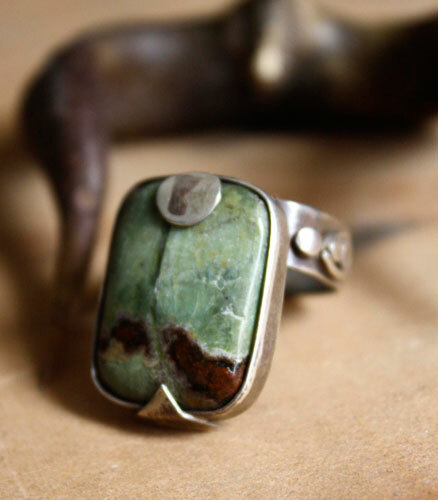 This ring is made of sterling silver that I made in my workshop and of an African prase jasper in green and brown hues with transparent lines. Its green color is soft and very relaxing. This rectangular green and brown cabochon jasper immediately evoked for me a piece of landscape, an aerial view of the forest vegetation. The brown coffee inclusion made me rethink a landscape of Japan whose mountains seem to spring from the green carpet of vegetation. So I named this ring Yama means mountain in Japanese. To reinforce the vegetal side of this ring, I set the stone on a plant pattern made of symbolic leaf and flowers, made of silver wire. 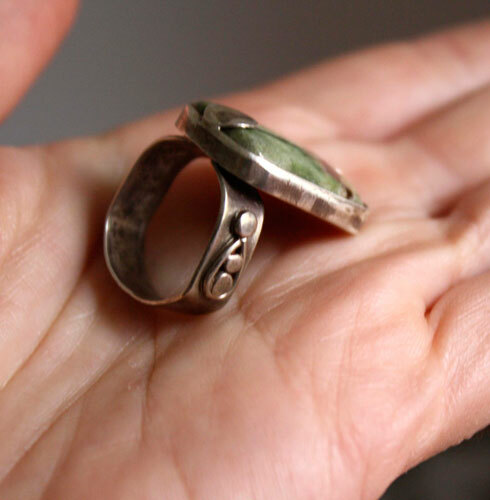 The ring itself is decorated with a drawing evoking nature. It is a size 6. It cannot be resized. 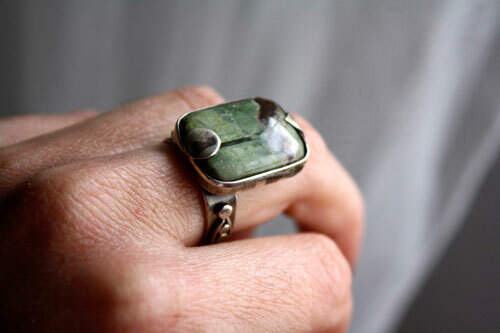 Tag: ring, sterling silver, jasper, green, coffee, clear, oxidized, plant, floral, botanical, ecological, organic, flower, rectangle, leaves, semi-precious stone, japan, japanese, landscape, mountains, vegetation, forest.